I did a day course on fermentation in Ballymaloe a few months ago, and ever since I’ve been fermenting and pickling foods until the cows come home! Despite fermentation coming hugely into fashion in the last year, it’s an ancient form of food preparation with massive health benefits. 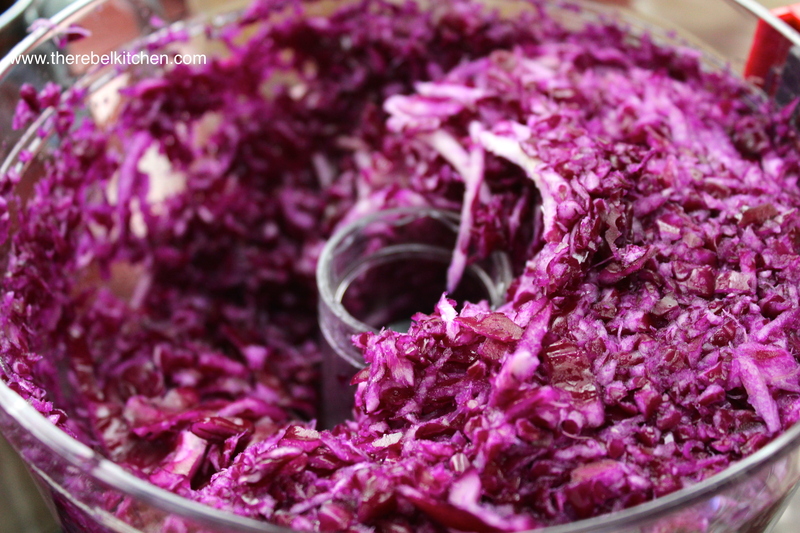 Fermented foods are great for the gut, so anybody with digestive issues (or people with healthy guts who want to keep them that way) should try incorporating them into their diets. I’ll admit, the term ‘fermented foods’ doesn’t exactly get most people’s mouth watering if they haven’t tried them before, however once people try them and realise that fermented vegetables, breads (like my sourdough) and drinks don’t taste like old socks, they usually become hooked. 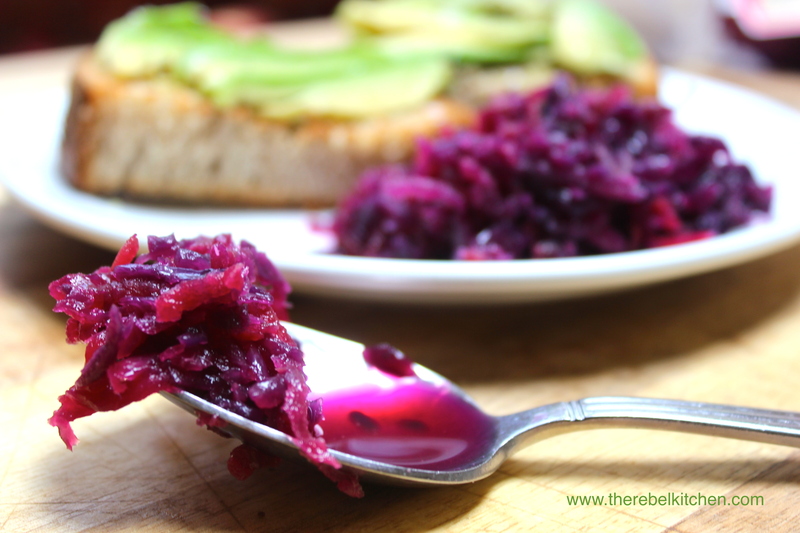 I love slightly sour tasting foods and anything bursting with flavour, so this particular recipe is a favourite of mine. 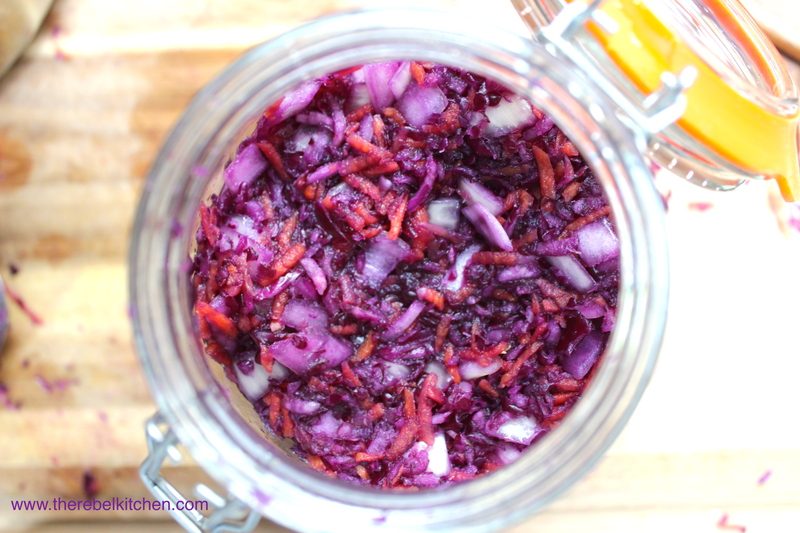 If you’re new to fermentation then try this recipe, it’s the tastiest, cheapest and easiest to make. I like to eat a few spoons of it as a side with lunch or dinner. It’s also a tasty sandwich filling (especially in a Rueben). Pop your fermentation cherry (sounds so wrong but tastes so right) today and you won’t look back! Chuck In A Kilner Jar & Let Nature Work Its Magic! 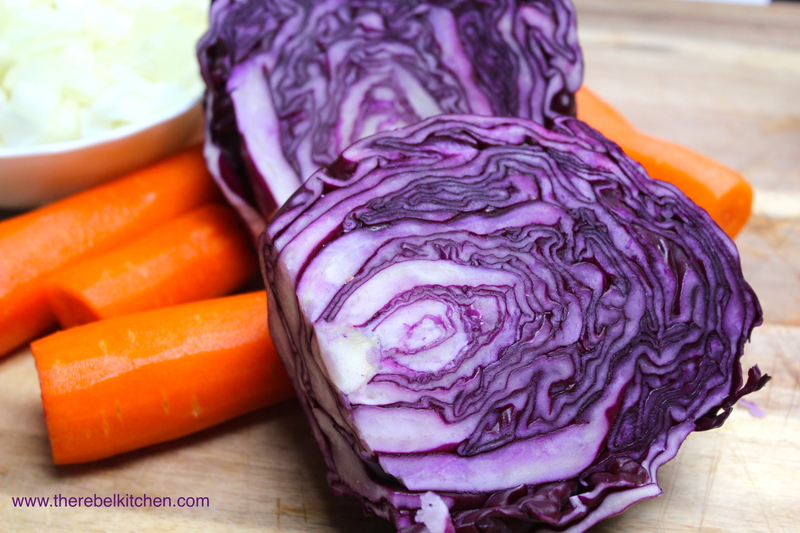 Coarsely grate the cabbage, carrot and onion. If you have a food processor you’ll make quick work of this step. Don’t grate them too finely, you want to retain some bite to your veg. Put all the grated veggies into a huge bowl and sprinkle all the salt on top. Mix it all together and squeeze and scrunch the veggies between your hands. 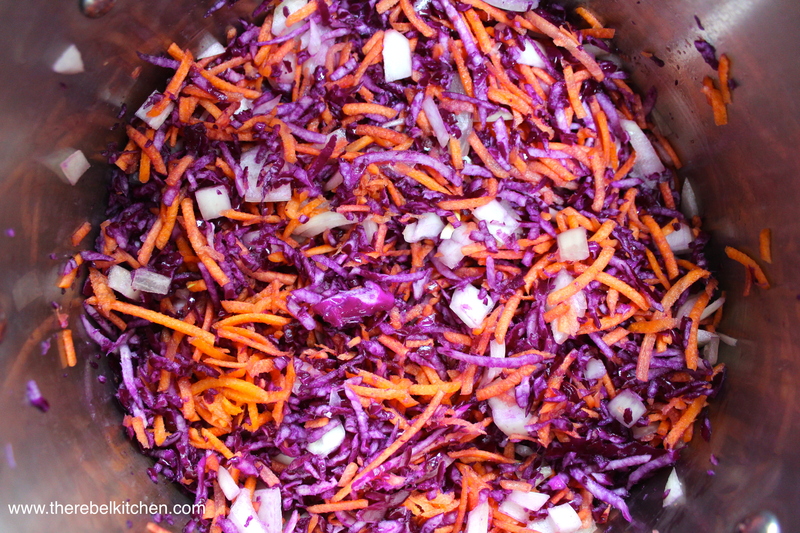 Do this for about 5 minutes until some liquid starts coming out of the vegetables. Put the veg and their juice into a 2 litre, sterilised Kilner jar. 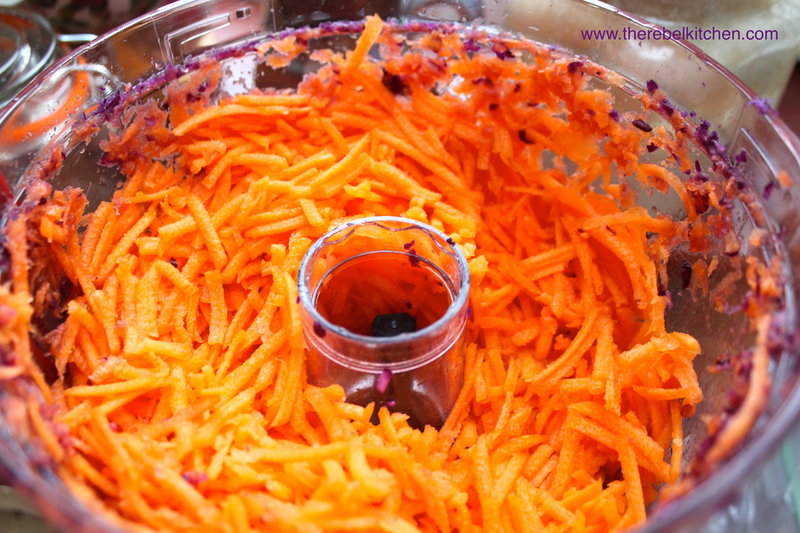 Pack the veg right down to the end of the jar with your fist, the juice should rise above the top of the veg. Get a glass weight (like a tea light holder) and place on top of the veg- this keeps the veg down and a little liquid above the veg which prevents mould from forming. Close the lid of the jar. If you can’t find a weight, then check on the jar a few times a day and push the veg back down if necessary. After 5 days in a cool dry space (out of direct sunlight) the mix should be perfectly sour, but not too sour. Taste a little spoon each day though to ensure it’s to your taste, you may prefer it after 3 days or 7 days etc. When you’re happy, put the jar in the fridge where it will keep fresh for months! Enjoy everyday with whatever you fancy! 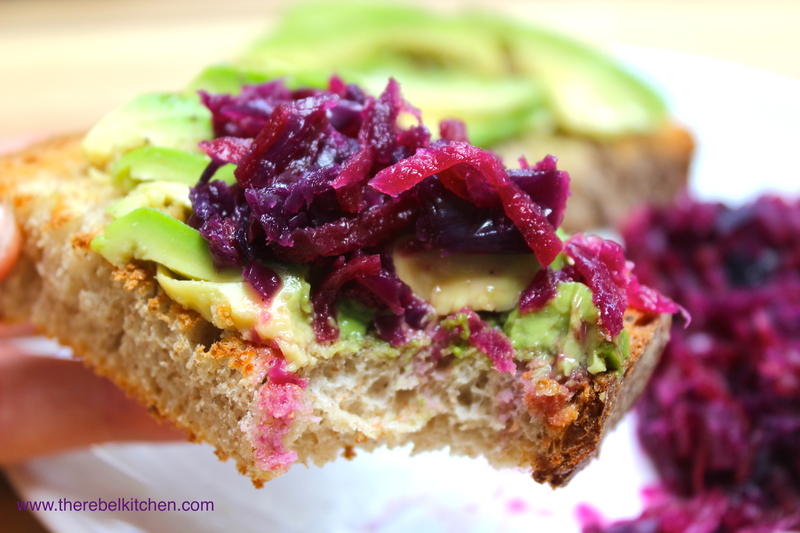 This Lovely Fermented Purple Pickle Goes Perfectly With Avocado Toast!